Cornet Steven Hotson and the townsfolk of Langholm welcome our Common Riding visitors. Langholm is located 21 miles north of Carlisle, England and 24 miles south of Hawick, on the A7 trunk road. From the south, the town is the gateway to some of the most the spectacular scenery that Southern Scotland has to offer. Rich in history, Langholm was the centre of the Border Reiver insurrections, Scotland's equivalent of the 'Wild West'. Rich in history, Langholm has been the mother to many famous sons, including Thomas Telford, the famous Civil Engineer and the 'Father of Modern Civil Engineering', William Julius Mickle, Poet and Author of 'There's Nae Luck Aboot The Hoose', and more recently, Christopher Murray Grieve, who wrote under the pseudonym of Hugh MacDiarmid, Scotland's greatest poet of modern times, to whom a Memorial (by Sculptor Jake Harvey) was erected on the slopes of Whita Hill in 1988. It is not generally known that the famous actor, the late James Robertson Justice, was born in the Crown Hotel as a consequence of his mother having to make an emergency break in her journey. Sadly he never claimed any connection with the town. The town is also the home of the Armstrong Clan and had a visit from Neil Armstrong, the first man on the Moon, who received the freedom of the town. Industrially, Langholm is prominent in the tweed industry, and is home to such famous names as Reid and Taylor, Arthur Bell Scotch Tweeds, and The Edinburgh Woollen Mill Ltd., which is now part of Grampian Holdings. In a different field, Border Fine Arts is one of the foremost manufacturers of hand painted figurines in the world. Collectively, these companies have been able to secure a high level of employment in the town. 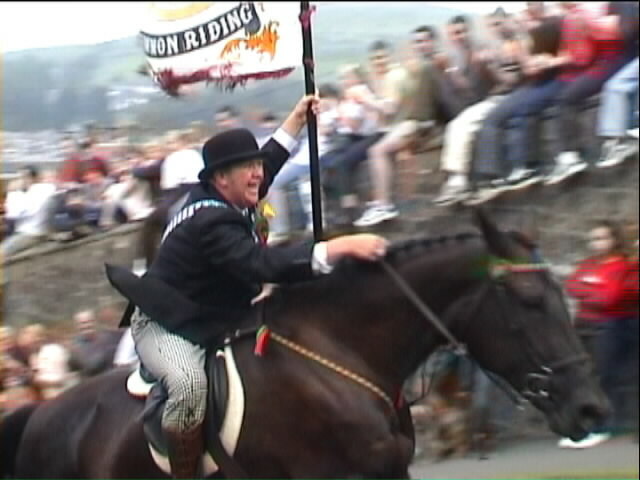 Langholm is famed for its annual Common Riding, and a full description appears elsewhere in these pages. Langholm Academy provides the full range of secondary education, and the high proportion of students who continue into further education are a reflection of the high standards achieved. The Langholm Town Band is reputedly the oldest brass band in Scotland and participates in a number of events throughout the year, notably at the Common Riding. Langholm's Pipe Band is also a highly acclaimed ensemble who have won many awards and is distinguished by having players of both sexes within its ranks. The Langholm Amateur Operatic and Dramatic Society performs several productions each year. The operetta production which is staged each March is an eagerly awaited event in Langholm's musical calendar. The most famous of its former members is Gregor Fisher, who is known the world over as 'Rab C. Nesbitt'! Langholm is also rich in sporting activity, and its first class Rugby Union team is probably its most important focus. Golf, Cricket, Bowls, Tennis and Football are also popular activities. Socially there are a goodly number of clubs and societies (some listed in our directory), which ensure a bright social life for the people of the town. The town has no pubs, but four hotels with thriving bars and restaurants more than compensates. The river Esk which flows through Langholm is one of Scotland's greatest salmon fishing rivers. If you are visiting the south of Scotland, you may always be assured of a warm welcome here in Langholm. Thanks to Douglas Harkness, Denis Male, Richard Stanbrook, Bruce McCartney and Frank Zemla for collaborating with me in the preparation of the Langholm Pages. 'Franks Page' - from Frank Zemla, with more information about Langholm, including a guide for disabled people. Electric Soup © I.W.Logan MCIT 1998-2000. Last updated: 14 Aug 2000 at 1640BST.